The Security Council unanimously adopted a resolution, condemning in the strongest terms the nuclear test conducted by the Democratic People’s Republic of Korea (DPRK) on 9 September 2016, and strengthening the sanctions regime imposed on that country. Strongly condemning the nuclear test conducted by the Democratic People’s Republic of Korea (DPRK) on 9 September, the Security Council today unanimously adopted measures that United Nations Secretary-General Ban Ki-moon described as “the toughest and most comprehensive sanctions regime ever” against that country. Through a unanimously adopted resolution, the 15-member Council reaffirmed that the DPRK should not conduct any further nuclear tests, launches using ballistic missile technology, or any other provocation. The sanctions target revenue sources for the North-east Asian country’s nuclear or ballistic missile programmes, with the Council for the first time imposing a limit on how much coal the DPRK can export per year. According to the resolution, total exports of coal from the DPRK to all Member States should not exceed $400 million or 7.5 million metric tonnes annually, whichever is lower, beginning January 1, 2017. For the remainder of this year, the ceiling is $53.4 million, or one million metric tonnes. Further to the text, each Member State that procures coal from the DPRK must report the aggregate amount of the volume of such procurement monthly. When 95 per cent of the aggregate yearly amount has been reached, Member States will be notified that they must immediately cease procuring coal from the DPRK for the year. “I welcome the unanimous adoption of this new resolution. Maintaining such unity is crucial in tackling security challenges on the Korean Peninsula and beyond,” Mr. Ban told the Council. The UN chief noted that since January, the DPRK has conducted two nuclear tests and at least 25 launches using ballistic missile technology, including launches of satellite, submarine-based ballistic missiles, and medium- and intermediate-range ballistic missiles. This year, the Council has met on nine occasions in emergency consultations in response to the DPRK’s nuclear tests and ballistic missile activities. “This is an unprecedentedly high number,” he said. The resolution adopted today took nearly three months to materialize, following the nuclear test in September. “The time taken to reach agreement on this resolution vividly illustrates the complex nature of the challenge,” Mr. Ban said.“We must assume that, with each test or launch, DPRK continues to make technological advances in its pursuit of a military nuclear capability. The increase in and nature of these activities pose an ever growing threat to regional security and the global non-proliferation regime,” he added, urging all Member States to make every effort to ensure that these sanctions are fully implemented. The resolution also contains additional measures aimed to further restrict the DPRK’s hard currency revenues, and the activities of the DPRK’s diplomats and other officials. 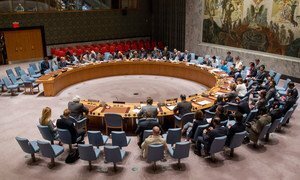 The United Nations Security Council today strongly condemned the latest failed ballistic missile launch conducted by the Democratic People’s Republic of Korea (DPRK), which took place on 14 October.